During its routine yearly monitoring of the weather on our solar system’s outer planets, NASA’s Hubble Space Telescope has uncovered a new mysterious dark storm on Neptune and provided a fresh look at a long-lived storm circling around the north polar region on Uranus. Like Earth, Uranus and Neptune have seasons, which likely drive some of the features in their atmospheres. But their seasons are much longer than on Earth, spanning decades rather than months. The new Hubble view of Neptune shows the dark storm, seen at top center. Appearing during the planet’s southern summer, the feature is the fourth and latest mysterious dark vortex captured by Hubble since 1993. Two other dark storms were discovered by the Voyager 2 spacecraft in 1989 as it flew by the remote planet. Since then, only Hubble has had the sensitivity in blue light to track these elusive features, which have appeared and faded quickly. A study led by University of California, Berkeley, undergraduate student Andrew Hsu estimated that the dark spots appear every four to six years at different latitudes and disappear after about two years. Hubble uncovered the latest storm in September 2018 in Neptune’s northern hemisphere. The feature is roughly 6,800 miles across. To the right of the dark feature are bright white “companion clouds.” Hubble has observed similar clouds accompanying previous vortices. The bright clouds form when the flow of ambient air is perturbed and diverted upward over the dark vortex, causing gases to freeze into methane ice crystals. These clouds are similar to clouds that appear as pancake-shaped features when air is pushed over mountains on Earth (though Neptune has no solid surface). The long, thin cloud to the left of the dark spot is a transient feature that is not part of the storm system. It’s unclear how these storms form. But like Jupiter’s Great Red Spot, the dark vortices swirl in an anti-cyclonic direction and seem to dredge up material from deeper levels in the ice giant’s atmosphere. The Hubble observations show that as early as 2016, increased cloud activity in the region preceded the vortex’s appearance. The images indicate that the vortices probably develop deeper in Neptune’s atmosphere, becoming visible only when the top of the storm reaches higher altitudes. The snapshot of Uranus, like the image of Neptune, reveals a dominant feature: a vast bright stormy cloud cap across the north pole. Scientists believe this new feature is a result of Uranus’ unique rotation. Unlike every other planet in the solar system, Uranus is tipped over almost onto its side. Because of this extreme tilt, during the planet’s summer the Sun shines almost directly onto the north pole and never sets. Uranus is now approaching the middle of its summer season, and the polar-cap region is becoming more prominent. This polar hood may have formed by seasonal changes in atmospheric flow. Near the edge of the polar storm is a large, compact methane-ice cloud, which is sometimes bright enough to be photographed by amateur astronomers. A narrow cloud band encircles the planet north of the equator. It is a mystery how bands like these are confined to such narrow widths, because Uranus and Neptune have very broad westward-blowing wind jets. Both planets are classified as ice giant planets. They have no solid surface but rather mantles of hydrogen and helium surrounding a water-rich interior, itself perhaps wrapped around a rocky core. Atmospheric methane absorbs red light but allows blue-green light to be scattered back into space, giving each planet a cyan hue. The new Neptune and Uranus images are from the Outer Planet Atmospheres Legacy (OPAL) program, a long-term Hubble project, led by Amy Simon of NASA’s Goddard Space Flight Center in Greenbelt, Maryland, that annually captures global maps of our solar system’s outer planets when they are closest to Earth in their orbits. OPAL’s key goals are to study long-term seasonal changes, as well as capture comparatively transitory events, such as the appearance of Neptune’s dark spot. These dark storms may be so fleeting that in the past some of them may have appeared and faded during multi-year gaps in Hubble’s observations of Neptune. The OPAL program ensures that astronomers won’t miss another one. 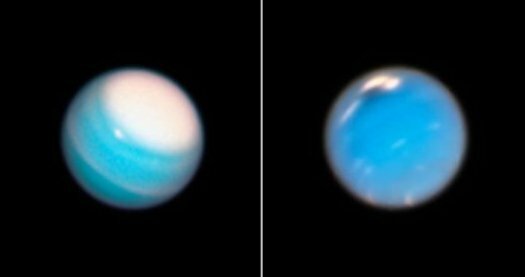 These images are part of a scrapbook of Hubble snapshots of Neptune and Uranus that track the weather patterns over time on these distant, cold planets. Just as meteorologists cannot predict the weather on Earth by studying a few snapshots, astronomers cannot track atmospheric trends on solar system planets without regularly repeated observations. Astronomers hope that Hubble’s long-term monitoring of the outer planets will help them unravel the mysteries that still persist about these faraway worlds. Analyzing the weather on these worlds also will help scientists better understand the diversity and similarities of the atmospheres of solar-system planets, including Earth.